This post is sponsored by Field Roast and all opinions are my own. Since I became vegan, I've been trying to convince my family to have a meat-free thanksgiving. This year I'll be using Field Roast products to make it happen and can't wait for them to give it a try. They are fairly priced, the flavors/textures are to die for and they mix well with so many other thanksgiving recipes. My family traditions were always based around the food at the table, filled with kisses, laughs, love, and so many happy stomachs. I've been vegan for 3 ½ years and this will be my very first thanksgiving I'll be hosting and of course 100% plant-based! I've set this table with a winter salad, baked butternut squash, a simple pasta, and the Celebration Roast by Field Roast. This small table full of colors is something that anyone can prepare. Here are some simple staples for this year’s upcoming thanksgiving. Loads of potatoes, squash, salads, chili stews, pastas, roasted veggies, fresh juices, and why not tacos as well? Check out #Fieldroast website here. 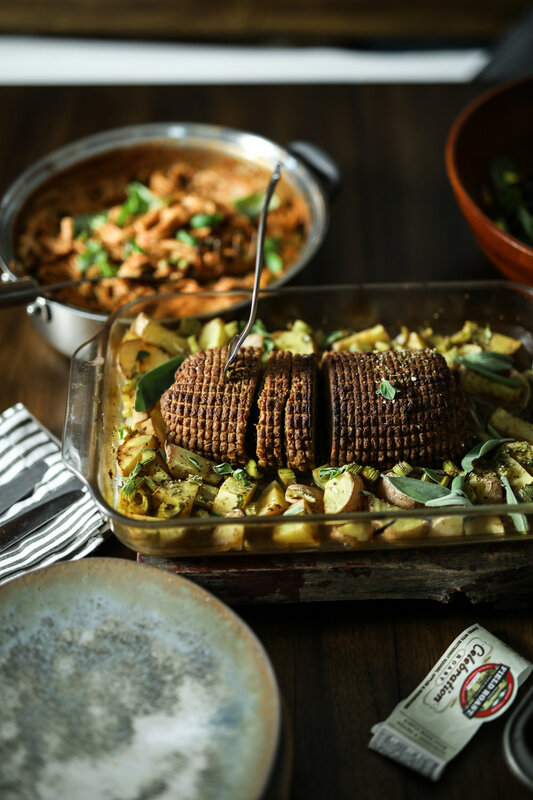 Looking for an easy, delicious, plant-based alternative to a pork roast? Try this Field Roast Celebration Roast. Open the package and put onto a baking tray. Chop up 3-4 large potatoes, 1 roughly chopped onion, 3-4 chopped celery stocks, and a medley of herbs, mix well in a large bowl with 1 tbsp of garlic granules, 2 tsp of salt, and a pinch of black pepper. Add this to a baking tray, add the Celebration Roast and some vegetable broth so everything stays nice and moist. Bake for 35 minutes at 400 F. Make sure to cover the tray with aluminum foil and check on it at 30 minutes. Voila you're done and this will make 4-6 servings. Pair it with a salad and any other meal of your choice. Place squash, cut sides down, in a 9x13 baking dish. Pour water into dish around squash halves, drizzle 2 tbsp of oil, dried oregano, and a pinch of salt/black pepper. Bake in the preheated oven until tender and easily pierced with a fork, about 1 1/2 hours. Option to remove the skin with a fork; it should be very easy to remove. Then serve with a bed of greens.